In this economy, finding affordable jewelry is very important, but we shouldn’t be willing to sacrifice style over price. I am pleased to introduce you to a company today that can give you both factors- gorgeous jewelry and unbelievable prices. That company is Domaine Factory Outlet. They are no strangers to the retail and catolog industries and have been in business over 14 years. 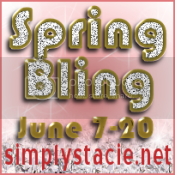 You can find their products in may national retail stores, boutiques and online catalogs. They pride themselves on their beautiful jewelry collections and exemplary customer service to bring you a smooth and seamless transaction. The selection is HUGE. They have everything jewelry you can dream of from earrings, bracelets, necklaces, rings, pins, watches and even a bridal collection. I couldn’t get over the prices as I was browsing through their site. They are phenomenal!! You are getting a great deal when you shop at Domaine Factory Outlet. I received a necklace from the Beadelle by Domaine Collection called The Lindsay. 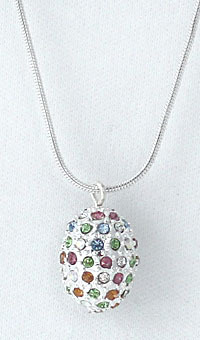 It is a silver oval shaped egg covered in multi-coloured stones. It’s beautiful and so very sparkly. The stones just glitter in the light. I like that its not too big and is more on the dainty side. 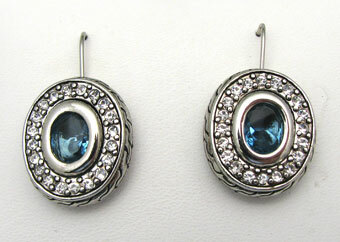 It looks very feminine and will dress up any outfit you wear. It sort of reminds me of a Faberge Egg. They are always so gorgeous and this necklace is like a little mini one. I love the smooth, sleek look of the silver snake chain. They have so many too choose from in different colour of stones. This particular necklace I received costs $44.99. Check out Domaine Factory Outlet and buy yourself something pretty. You deserve it! I love the Trendy Jet Multi Row Necklace. I would get “The Whitney” necklace, so pretty! I like the Disco Earrings. I LOVE this! What a clever design! I have retweeted!